People nowadays want to work on their own conditions. However, there are some people who prefer to work as a full-time employee since they need employer stability, fixed pay and other privileges of a full-time employee. While choosing what is best for you, you should think about your needs and conditions. The two fields have their very own advantages and disadvantages, and what is appropriate for you exclusively relies upon how you need to function. Job security: A full-time employee has a fixed job. They enjoy benefits like sick leaves, insurance, PF, paid holidays (depends on the organization) etc. whereas A freelancer may not get such benefits as he/she has to pay from her pocket. A full-time employee may have fear of losing a job if he doesn’t perform well whereas this is not the case with freelancers as they are their own boss. Flexibility: Freelancers have flexibility in their job i.e., they can work whenever and wherever they want. They can work at night/early morning, in a cafe or gardens etc. Whereas, Employee has a fixed working schedule. Salary: Salary of the full-time employee is fixed. As they have a secure job, a fixed salary also provide security. Fixed pay can help to plan the budget. In the case of a freelancer, they do not have a fixed salary. The sky is the maximum limit of their earning (depending upon the skills). Training: An employer has to spend on the employee’s training. Every employee has to go through the training. However, Freelancer need not go for the training as they train themselves. Work/personal life balance: As a full-time employee has a fixed schedule, they can plan and spend their remaining time with their family/friends. A freelancer may need to work on weekends or on holidays as per the client’s requirement. However, If freelancer wishes to spend time with their family/friends, they can skip bidding on the projects for a specific period. 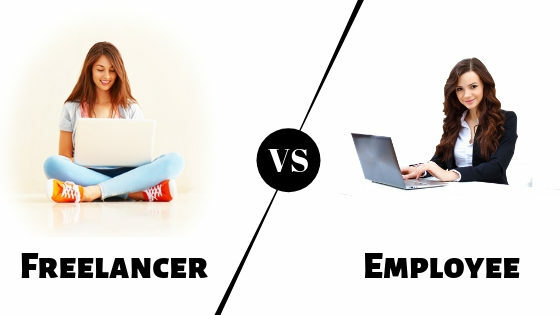 Freelancers can choose if they have to work or not. Motivation: An employee working for an organization may be motivated with the events like “Employee of the year”, Bonus/Incentives, Promotion, Salary Increment etc. A freelancer has to motivate himself. Tax: An employee does not pay the employment tax, it is paid by the employer. Whereas, the freelancer has to pay self-employment tax. This can be one of the disadvantages for the freelancer. Holidays: a Full-time employee has a fixed number of holidays they can plan accordingly. However, if the number of holidays is over, the employee may find it difficult to ask for a leave. In the case of the freelancer, they can get as many leaves they want (they can skip bidding on new projects). Freedom: Freelancers have the freedom to choose which project they want to work on. They can also work with different clients at once. Employee have no choice on the projects, they have to work on the projects assigned to them by the employer. Up To Date with technology: A freelancer has to keep himself up to date with the latest technology to grab the more opportunity. An Employee may also need to be updated but it may not be necessary because their organization may continue working on an old technique which is also on demand. Freelancing and working as a full-time employee, both has its own importance. It’s better to consider all the parameters and choose the right option.